Aaron Devine from Kirby Engineering required a storage system for oils, grease lubricants, engineering equipment and backup supplies for a wind farm site. There also was a necessity for lighting and power within the requested store. Kirby Engineering also requested a light to be fitted externally with a PIR sensor which was required to be powered back to an IP board externally. The unit was requested to be painted in Green RAL 6003 to match the environment it was to be located in. We discussed his requirements and options that he required and proposed the below 6 meter walk-in store. Storage: Fixed galvanised grid storage shelves fitted to sides and rear wall, 600mm deep. 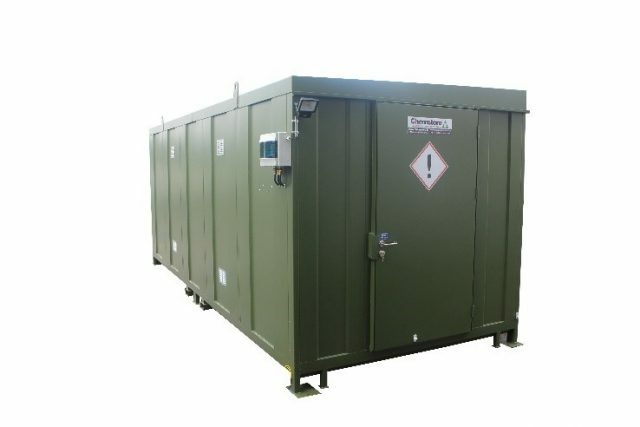 Sump: Fully welded and leak tested, corrosion resistant coated, steel sumps fitted under floor level, capacity 1,500L (exceeds current EPA guidelines which state that the bund capacity should be a minimum of 25% of the total volume to be stored). Floor: Removable hot dipped galvanized grid mesh floor & shelving. Lifting: Unit is fitted with roof-fixed crane lifting points to allow for easy unloading and relocation if required. Light Fitting: 2 No. Twin 5’ Light fittings complete with on/off switch. Sockets: 2 No. Twin 16A IP65 rated sockets fitted internally. External Light: PIR sensored external light fitting. Smoke Detector: Smoke detection unit fitted internally wired back to external board with signal to alert alarm. Access: Single hinged access door fitted with deadlock locking mechanism. Finish: Fully welded 2mm sheet steel used throughout to maximize security. All steel coated with high build Acrylic paint finish system to ISO 3233:1998.